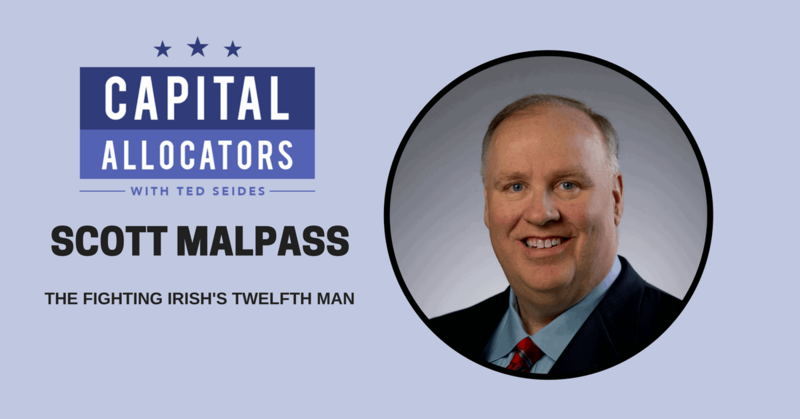 Scott Malpass is the esteemed Vice President and CIO of Notre Dame University, where he oversees the school’s $12 billion endowment. Scott earned his B.A. and M.B.A. degrees at Notre Dame, and returned to South Bend at the ripe age of 26 following a brief stint on Wall Street. His track record for almost 30 years, as defined by both performance and impact, place him indisputably in rare company at the very top of the field. Our conversation is a full-blown master class on endowment management, including the benefits of a long tenured team, asset allocation frameworks, passive management, preparing for dislocations, the state of venture capital, sourcing, monitoring and exiting managers, incremental process improvements, professional and personal development, and education and alignment across constituencies. It’s hard not to be in awe of Scott’s combination of humility, experience, and success.